Harald Høffding (11 March 1843 – 2 July 1931) was a Danish philosopher and theologian. Born and educated in Copenhagen, he became a schoolmaster, and ultimately in 1883 a professor at the University of Copenhagen. He was strongly influenced by Søren Kierkegaard in his early development, but later became a positivist, retaining and combining with it the spirit and method of practical psychology and the critical school. The physicist Niels Bohr studied philosophy from and became a friend of Høffding. The philosopher and author Ágúst H. Bjarnason was a student of Høffding. 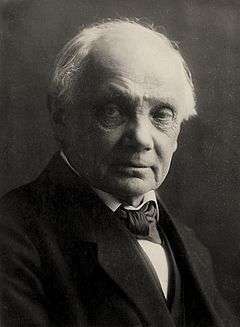 Høffding's great-nephew was the statistician Wassily Hoeffding. His best-known work is perhaps his Den nyere Filosofis Historie (1894), translated into English from the German edition (1895) by B.E. Meyer as History of Modern Philosophy (2 vols., 1900), a work intended by him to supplement and correct that of Hans Brøchner, to whom it is dedicated. His Psychology, the Problems of Philosophy (1905) and Philosophy of Religion (1906) also have appeared in English. Among Høffding's other writings, most of which have been translated into German, are: Den engelske Filosofi i vor Tid (1874); Etik (1876); Psychologi i Omrids paa Grundlag af Erfaring (ed. 1892); Psykologiske Undersøgelser (1889); Charles Darwin (1889); Kontinuiteten i Kants filosofiske Udviklingsgang (1893); Det psykologiske Grundlag for logiske Domme (1899); Rousseau und seine Philosophie (1901); Mindre Arbejder (1899). Harald Høffding, 1891 "Outlines of psychology". Retrieved 2010-09-25. Harald Hoffding, 1906 "The Philosophy of Religion". Retrieved 2012-07-26. Harald Høffding, 1919 "A brief history of modern philosophy". Retrieved 2010-09-25. Harald Høffding, 1920 "Modern philosophers; lectures delivered at the University of Copenhagen during the autumn of 1902, and lectures on Bergson, delivered in 1913". Retrieved 2010-09-25.